A well-known nursery in the United States of America run by modern Vikings. From the 8th till the 11th Century- known as the Viking Age- big parts of the world, from East to West to South were colonized by the so-called Vikings(Norseman), the Danes and the Swedish. Settlements of the Vikings were not found in Europeonly, but all over the whole Continent. From the 9th till the 11th Century many of the Vikings, migrated eastwards and southwards what is now known as Russia; Belarus and the Ukraine. The Vikings settled coastal areas along the Baltic Sea and along inland rivers in Russian territories such as Staraya Ladoga and Novgorod, being engaged in trade and piracy. It, however ,were in particular the Europeans who suffered the most from the Viking raids. After the Christianization of the Norseman, the Vikings stoppedbarbaric expansion by pirating and became modern seafaring traders; farmers and nurserymen. In 1925, Robert Bennerup, born in 1903 inCopenhagen, migrated to the USA after having finished his horticultural education as an Estate gardener. In the USA, Robert met with Claudia, an American Governess of an Estate Farm and got married. 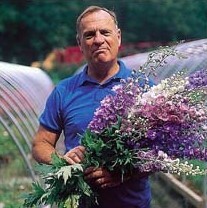 He started his own small nursery in 1929 in Bronxville, north from New York City. As he could not get more land, wishing to expand, he moved the nursery and his young family to Norwalk, Connecticut, in 1937 and established NorwalkPerennialGardens. After the second world-war in 1945 NorwalkPerennialGardens again had outgrown the land. Robert bought a large farm in Berlin which is located in the middle of the State Connecticut. He decided to change the name of the nursery into SUNNY BORDER NURSERIES. Sunny Border mainly was involved in the wholesale production of bare-root perennials; small conifers and woody ornamentals at that time, sold through a retail outlet. Many new plant varieties have been introduced by Sunny Border since its foundation in 1945, over 60 years ago. The most famous introduction, hybridized by Robert is undoubtedly VERONICA SUNNY BORDER BLUE , a cross between Veronica spicata and Veronica subsessilis. It is spread all over the world and it still is an important variety, grown by many growers in many countries, and though introduced in the 1940’s, it got the prestigious PLANT OF THE YEAR AWARD in 1993 by the Perennial Plant Association, 50 years after its introduction, which shows how valuable Veronica Sunny Border Blue is!! Many new varieties have been introduced since. Robert Bennerup passed away in 1967 in the age of 64. 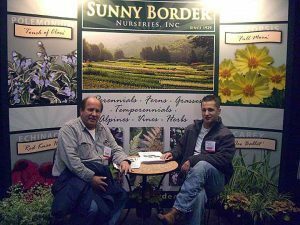 Nowadays Sunny Border Nurseries is run by Roberts sun Pierre, Chief Executive Officer and Marc Laviana, President of the company. When Pierrebought the nursery from his mother Claudia, he decided to take a new course, producing container grown perennials only. Now, in 2008, Sunny Border produces three and a half million plants yearly, having 3000 varieties in production plus 1000 varieties on trial on 14Ha of container fields at 5 different locations. Besides that, Sunny Border has 160,000 square metre of greenhouses at its disposal for the propagation of hardy herbaceous perennials; alpine plants; ornamental grasses; ferns etc. A complete new trendsetting repertoire is the production of non-hardy sub-tropical; tropical perennials and exclusive annuals, sold under the Trademark “BODACIOUS TEMPERENNIALS” with the slogan: Tropical Feel-Exotic Appeal. The head-grower of this program and Vice president of Operations is Zoltan Kovacs, originated from Hungary. Zoltan says that the garden center and landscaping market is changing fast and constantly and that’s why Sunny Border also serves its clients witha good mixture of exclusive annuals and rare and unusual tropicals to keep them competitive and to keep the businessrunning. Besides the main seat in Connecticut, Sunny Border opened a sister company in Jefferson, Ohio just with the new millennium. The “Modern Vikings” still try to conquer the world. Pierre Bennerup says: We go to the ends of the earth searching for the finest plants. We grow world-class perennials at the service of our true and new customers.